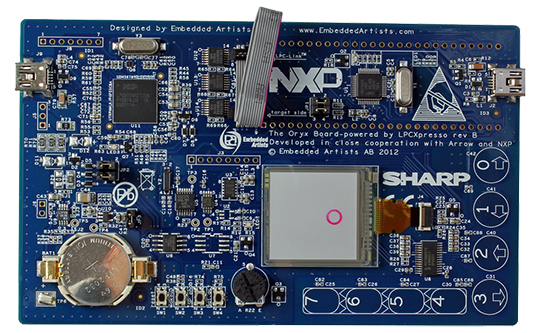 The Low-power Application Kit (Oryx) with NXP's LPC11U37 ARM Cortex-M0 microcontroller has been designed to make it as easy as possible to get started with Cortex-M0 and low-power designs. The board demonstrates low-power design techniques both in hardware and software. Includes an extensive user’s manual and many sample applications. The Oryx is one of four large antelope species. It prefer near-desert conditions and can survive without water for long periods – very low-power operation… just like this kit! Even in full operating mode, the Low-power Application Kit (Oryx) consumes only 42mW (3.0V, 14mA) and as low as 20uW (3.0V, 6.6uA) in power-down mode. There are multiple possibilities to control the power consumption of the board. NXP's Cortex-M0 LPC11U37 microcontroller in LQFP48 package. 512 KByte (4 Mbit) SPI FLASH for storing non-volatile parameters or other data (pictures). All LPC11U37 I/O pins are available on edge expansion connectors (2x27 pin rows, 100 mil pitch, 900 mil between rows) - LPCXpresso footprint. SWD/JTAG connector (50 mil/1.27 mm pitch, standard SWD/JTAG connector). Power consumption: 4µA with up-date rate of 1Hz, 2µA for static image. PCF8523 low-power real time clock with I2C interface, from NXP. Embedded JTAG (LPC-LINK) functionality via LPCXpresso toolchain. Push-button for enabling Bootloader mode of the LPC11U37.